This vintage Art Deco navy blue sheer silk chiffon rhinestone beaded flapper dress dates from the 1920s. 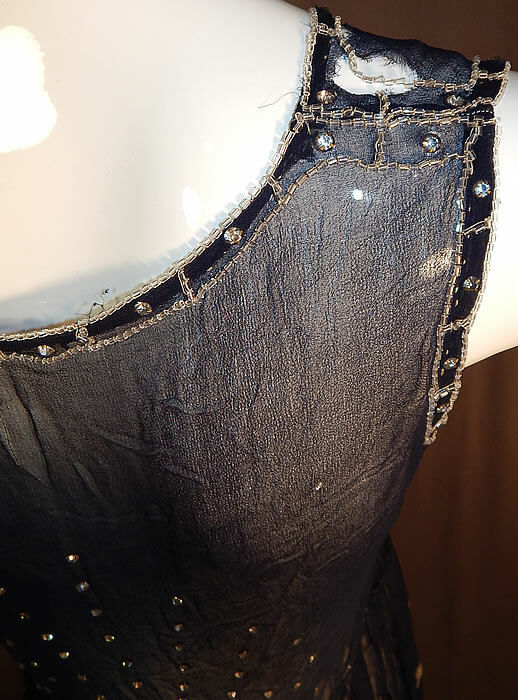 It is made of a navy blue sheer silk chiffon fabric with rhinestone, crystal beading. This fabulous flapper dress has a fitted top sleeveless style, beaded scalloped short full skirt, shoulder, side snap closures and is sheer, unlined. The dress measures 35 inches long, with a 28 inch waist and 36 inch bust. It is in good as-is condition, needing some minor restoration reinforcing the shoulders which have small frayed holes and a few tiny pin holes on the skirt. This is truly a wonderful piece of Art Deco beaded textile art which would be great for design!